Yet another oft-repeated Western trope about Russian politics is that Putin has “lost the middle classes” (Brian Whitmore, paging Kudrin), that it is liberals who speak for the middle class (Fred Weir), or even that it is not just the middle class who are against Putin but the masses too (Masha Gessen). Let’s look at some numbers, figures, statistics, etc. Putin appears to be as popular as ever. After reaching a multi-year of 63% approval in December 2011, he is now back at his typical 69% (Levada). Another poll indicates th at 52% of its respondents would vote for Putin if elections were held tomorrow, compared with 9% for Zyuganov, 7% for Zhirinovsky, and 6% for Prokhorov (FOM). Likewise United Russia remains by far the most popular party, at 44% versus the second place Communists with 12%, despite the propaganda against it and well-publicized recent electoral losses in a few cities. So obviously there is no “mass movement” against Putin. Now what about the more minimal form of this argument, that while Putin might retain support among blue-color workers (disparaged as uneducated, unenlightened, etc) the middle classes have deserted him? But in that case, why did a plurality of even the richest Muscovites vote for Putin? 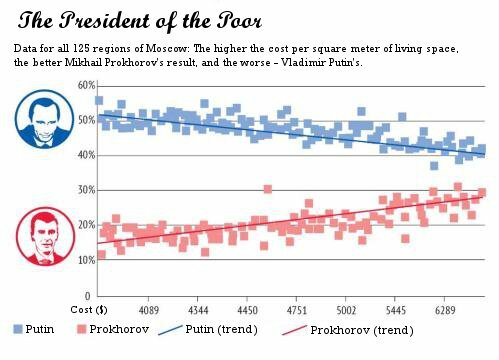 The graph above shows that whereas it is true that Putin becomes less popular as you move into more expensive areas of the city, the lines never converge. There is not a single area of Moscow in which Prokhorov, the liberal candidate, scores better than Putin. Note further that Moscow is the most oppositional region in Russia and the scene of 75%+ of all the recent protests against Putin. Could anyone please explain what how anyone could possibly, honestly argue, in light of the evidence above, that the middle class is “lost” to Putin? One can certainly argue that the pillars of Putin’s support has shifted from the middle class to the blue-collar heartlands. One can also argue that some sections of the middle class – such as the young, those who go to elite universities, and various cultural/occupational subgroups such as hipsters and journalists – are indeed more against Putin than for him. 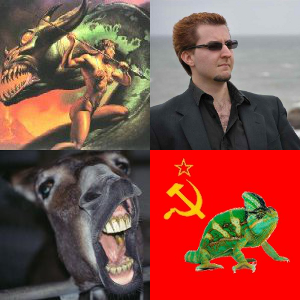 However, these people do not constitute the middle class. They are an even narrower slice of Russian society. 7 Comments to "Hipsters and Democratic Journalists Might Not Support Putin, But the Middle Class Does"
An entirely necessary and good corrective article. It is a peculiarly bizarre form of degenerated Marxism to see middle class voters as standard bearers of revolution. In Russia this mistake is partly explained by the fact that since liberals are middle class most middle class people are assumed to be liberals. There is also a strong ideological presumption that most middle class people want to live in societies like those in the west, which is also assumed to predispose them to be liberals. In reality the middle class is liberal in no country that I know. The natural voting pattern for middle class voters in every country I am familiar with is not liberal but conservative. A moment’s reflection shows why. As accumulators of wealth and property middle class voters have a vested interest in stability, which naturally inclines them to support the status quo. In a country like Russia, which has only recently emerged from an intense political and economic crisis, that inclination will be even stronger than in other more stable countries. That most middle class Russians therefore vote for Putin as the guarantor of the stability is no more than what one should expect and sure enough it is what polling data and election results discussed in the post show. Ah, the elusive Russian middle class. Defined narrowly or broadly, it’s always constructed to fulfill one’s teleological desire. Some of my favorite specious historical arguments are that if Imperial Russia had a middle class, 1917 would have never happened. But definitions matter, nonetheless, and as much as I enjoy Whitmore’s analyses, his definition is too narrow. It ignores many social elements, mainly the infamous buzhetniki some of who live quite nicely. I think the recent interview with Leonid Grigoryev on the Valdai Club site is worth considering. “The middle class can be defined in terms of education and profession, income, property, financial stability, social behavior and by self-identification. The upper middle class consists of people with a high level of income and financial stability, such as top managers, bureaucrats and a small part of the intelligentsia. They are able to vacation abroad several times a year, have a well-appointed flat, a house in the countryside and at least two cars. This is approximately what the upper middle class in the West looks like. The upper middle class in Russia makes up 4% to 7% of the middle class. The middle-middle class consists of people with a higher education, a job, a flat and a car. Like their counterparts in the West, they have some savings but are only beginning to enjoy a degree of financial stability. Taken together, the upper middle class and the middle-middle class constitute up to 30% of the Russian middle class. This figure was around 25% in 2000, which means that growth has been minor in the past decade. The Russian lower middle class is similar to its Western analogue, at least in terms of education. It comprises people with a moderate income (secretaries, salespeople and desk clerks) and a passable education. In the West, lower middle class people also have some property and savings, but in Russia they are much poorer than the other two parts of the middle class. Let me get this straight. Parts of the middle class vote for UR, others for FR, and the rest for LDPR and the commies. The middle class is composed of richer, poorer, and average middle class folks. Some are businesspeople, others are bureaucrats, most of the rest are managers and intellectuals. Ah, the elusive Russian middle class. Defined narrowly or broadly, it's always constructed to fulfill one's teleological desire. Some of my favorite specious historical arguments are that if Imperial Russia had a middle class, 1917 would have never happened. But definitions matter, nonetheless, and as much as I enjoy Whitmore's analyses, his definition is too narrow. It ignores many social elements, mainly the infamous buzhetniki some of who live quite nicely. I think the recent interview with Leonid Grigoryev on the Valdai Club site is worth considering. "The middle class can be defined in terms of education and profession, income, property, financial stability, social behavior and by self-identification. Each of these three parts is subdivided into five groups: officials, the intelligentsia (budget-funded group), managers of large companies, and small and medium-sized business people." "The middle class is heterogeneous and hence is represented by several parties and movements in all countries. In Russia, part of the middle class (the two upper levels) votes for United Russia. Some support the country’s largest party by virtue of their position, while business people make a rational choice because United Russia is the ruling party. The few members of the middle class who support the Communist Party or the Liberal Democratic Party mostly made their choice long ago. A Just Russia also has a number of supporters among the middle class." I think it is useful. His category is complex and variegated, and more importantly doesn't assume a determinist view that the middle class has a particular politics or interest. I like it because it also gives presence to the state employee, which is often left out of discussions of the Russian middle class. Maybe it might be helpful for you to provide what your definition of the Russian middle class is? Your post assumes your have one, if only in contradiction to the pundits you use as foils. Your old Twitter sparring partner Peter Savodnik is at it again, slamming the Poles as slightly anti-Semitic people who whine too much. Wait I thought they were our plucky allies against Putin’s eternal Mordor? Clearly the Polish decisions to stay out of the euro were very shrewd, as were their decisions to pull out of Afghanistan and not get involved in the excellent Libya adventure. And it’s those decisions to be an ally rather than client state which have pissed some folks off against the Poles, along with perhaps the fact that Polish geology is not the same as the Marcellus or Bakken shales. It’s funny how a certain chap likes to rant about how Libya had no strategic value whatsoever, and that’s why Obama went for it, ignoring all that light, sweet sweet crude and BP being Obama’s top campaign contributor. But criticism of Obama is a-ok, as long as we don’t criticize the components of corporate America or corporate Britain that actually pulled the strings for the ‘Reset’ to happen. Because criticizing corporations for promoting Reset is mostly crimethink in GOP circles, anymore than saying anything nice about oil companies is in Democrat circles. It’s like admitting Israel is secretly shipping technology to Russia or the Russian military — all likely to provoke such massive cognitive dissonance it must be shunted out of sight, out of mind. I think it is useful. His category is complex and variegated, and more importantly doesn’t assume a determinist view that the middle class has a particular politics or interest. I like it because it also gives presence to the state employee, which is often left out of discussions of the Russian middle class. First, I do not think "middle class" has much explanatory value today in general. A century ago - a world of rising proles, lingering aristocracies, inequality, minimal welfare states, high social stratification, rigid social hierarchies and privilege/lack of meritocracy - sure. Today, when opportunities are inestimably more open to talent in all but the most backward countries, and all major political forces are converging on slightly different versions of basically the same thing (neoliberal technocracy) it is of vastly diminished relevance. All the above applies to Russia, which in addition also has high social mobility (according to some econometric studies), and where conflicts between generation; between Moscow and the regions; between ethnic Russians and immigrants; and between different social values (as in America's culture wars) now all appear to be far more important than any lingering class resentment. Second, I would also note that a majority of Russians, according to opinion polls, now describe themselves as middle class - and who are we to tell them different? Dismissing it as false consciousness is ultimately just arrogant and patronizing. Furthermore, even going by a narrower definition, i.e. say the 75th-98th percentile of wealth in Russia, the "middle class" itself doesn't behave as we expect it would; for instance, the KPRF is - counterintuitively - actually more popular in that (richer) Russian "middle class" than it is among the (poorer) 25th-75th percentile, where United Russia finds the mainstay of its support. Does it still make sense of talk of the middle class as any kind of coherent political, social, or economic entity then? First, I do not think “middle class” has much explanatory value today in general. A century ago – a world of rising proles, lingering aristocracies, inequality, minimal welfare states, high social stratification, rigid social hierarchies and privilege/lack of meritocracy – sure. Today, when opportunities are inestimably more open to talent in all but the most backward countries, and all major political forces are converging on slightly different versions of basically the same thing (neoliberal technocracy) it is of vastly diminished relevance. All the above applies to Russia, which in addition also has high social mobility (according to some econometric studies), and where conflicts between generation; between Moscow and the regions; between ethnic Russians and immigrants; and between different social values (as in America’s culture wars) now all appear to be far more important than any lingering class resentment. Second, I would also note that a majority of Russians, according to opinion polls, now describe themselves as middle class – and who are we to tell them different? Dismissing it as false consciousness is ultimately just arrogant and patronizing. Furthermore, even going by a narrower definition, i.e. say the 75th-98th percentile of wealth in Russia, the “middle class” itself doesn’t behave as we expect it would; for instance, the KPRF is – counterintuitively – actually more popular in that (richer) Russian “middle class” than it is among the (poorer) 25th-75th percentile, where United Russia finds the mainstay of its support. Does it still make sense of talk of the middle class as any kind of coherent political, social, or economic entity then?